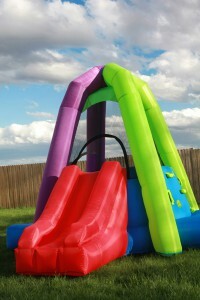 Inflatable bounce houses are becoming a staple at backyard birthday parties and other outdoor gatherings. But with children’s more frequent exposure to these popular party attractions comes a higher likelihood of injury, experts are finding. A new study, which looked at numbers from 1990 to 2010, found that more than 11,300 children were treated for bounce house-related injuries in 2010, twice the number from 2008. The study found that most injuries occurred from falls and collisions with other jumpers; more than half of the injuries included fractures, sprains and strains. While the study couldn’t pinpoint a reason for the increased number of bounce house-related injuries, the authors suggest their growing popularity, which Paul Kircher, ATC/L, an athletic trainer with Memorial SportsCare, said he agrees with. A big difference in renting a bounce house versus letting a child play in one at a carnival or fair, Kircher said, is that there is often no time limit on usage when a bounce house is in your back yard for the day, nor are capacity rules as closely followed. A child whose parents have rented or purchased a bounce house uses it for much longer than the four or five minutes he or she is allowed to jump at a carnival. The longer he or she plays, the more daring the child gets in the jumps and flips he or she attempts, and injuries become more likely. Kircher said children younger than 5 receive the most fractures, according to the study, so he recommends parents be especially observant with that age group and act as referees if children become to rambunctious. If a child does sustain an injury such as a muscle strain, he said parents should monitor the injury — apply the RICE (Rest, Ice, Compression, Elevation) method if necessary — and consult with a physician if the injured area continues to bother the child.